Braille Carbon Fiber and No-Weight Batteries provide reliable lightweight performance for racing. Check out the Recently Listed Batteries. Check out the Recently Listed Battery Chargers. FREE SHIPPING ! Ships from Michigan. $12.95 Flat Rate Shipping. Oversized / Overweight Item. Ships from Michigan. FREE SHIPPING! Oversized / Overweight Fees Waived On This Item! Ships from Michigan. $5.95 Flat Rate Shipping. Ships from Michigan. Oversized / Overweight item. Ships from Michigan. Pit Stop USA is The Online Motorsports Superstore! 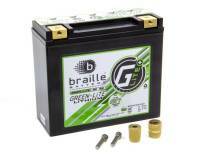 Braille Battery quest for lightness has lead to Braille Batteryas constant pursuit of the best products. 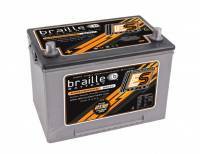 Braille Batteries allow you to start with the lightest battery and have reliable results. In 2004, Braille introduced the first Braile No-Weight Battery and followed with several additional models, Braille lightweight battery chargers and Braille aluminum battery mounts. 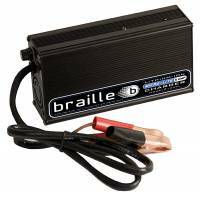 In 2007 Braille released the Worldas first carbon fiber battery line using advanced AGM technology and composite casings and also the B2317 and B2317R to suit top NASCAR racing teams. Braille has since celebrated multiple wins in NASCAR, ALMS, Formula D, SCCA Pro, IRL and other top level races. Braille Battery offers Braille Carbon Fiber Batteries from the 6.6 pound model Braille B106C Carbon Fiber Battery, to the Braille B14115C Carbon Fiber Battery , Braille B2015C Carbon Fiber Battery, Braille B3121C Carbon Fiber Battery and Braille B2015 Limited Edition Carbon Fiber Battery. Braille No-Weight Batteries models include the Braille B106 No-Weight Battery, Braille B129 No-Weight Battery, Braille B14115 No-Weight Battery, Braille No-Weight Battery, Braille B2015 No-Weight Battery, Braille B2317 No-Weight Battery, Braille B2317R No-Weight Battery, Braille B2618 No-Weight Battery and Braille B3121 No-Weight Battery. The Braille 2 Amp Trickle Battery Charger safely charges all Braille batteries. The Braille Battery Mount line includes Braille Vertical Aluminum Mount Kit, Braille B106 / B106C Aluminum Mount Kit, Braille B129 Aluminum Mount Kit, Braille B14115/ B14115C Aluminum Mount Kit, Braille B2015 / B2015C Aluminum Mount Kit, Braille B2317 / B2317R Aluminum Mount Kit, Braille B2618 Aluminum Mount Kit, Braille B3121 Aluminum Mount Kit and Braille Universal FRP Kits. We feature Braille Carbon Fiber Batteries, Braille No-Weight Batteries, Braille Battery Chargers and Braille Battery Mounts at low everyday prices!